How Life Works is about why the same things keep happening to you. It is a fun book on living life, with the wisdom of a manual but without the seriousness. It helps you figure out WHY bad things happen? WHY some people are rich while others aren’t? WHY bills come in bunches? and why it all seems to work in a patten. The good news: you are not your patterns and YOU CAN CHANGE YOUR PATTERNS. This book shows you the nuts and bolts of life. It looks at your thoughts and how they shape your life and shows you how to change them to attract good health, prosperity and happiness. With lots of happy cartoons and sketches by the author - Andrew Mattews WHY READ THIS BOOK • For all the wisdom that this book delivers, it is still fun to read and makes you have a good time while understanding the life philosophies that bring you success - the cartoons are a treat for the reader. THIS BOOK IS ABOUT : - how to find the love of your life - how to find the work you love - why some people always fall on their feet – and how you can be like them. - how to change your thoughts to change your reality ABOUT THE AUTHOR Andrew Matthews is one of the world’s most widely read self-help authors. 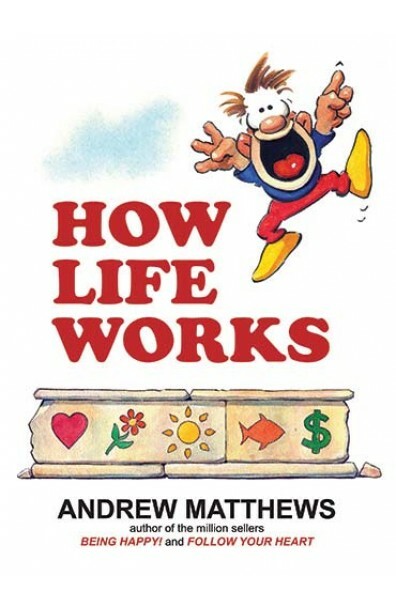 Andrew Matthews’ books, including HOW LIFE WORKS and BEING HAPPY have sold over 7 million copies in 42 languages, in 60 countries. Andrew is a popular international speaker and he has addressed over 1000 international corporations. His presentations are laced with humour and he draws lightning-fast cartoons as he speaks!